he day has finally arrived–paint the kitchen floor day. 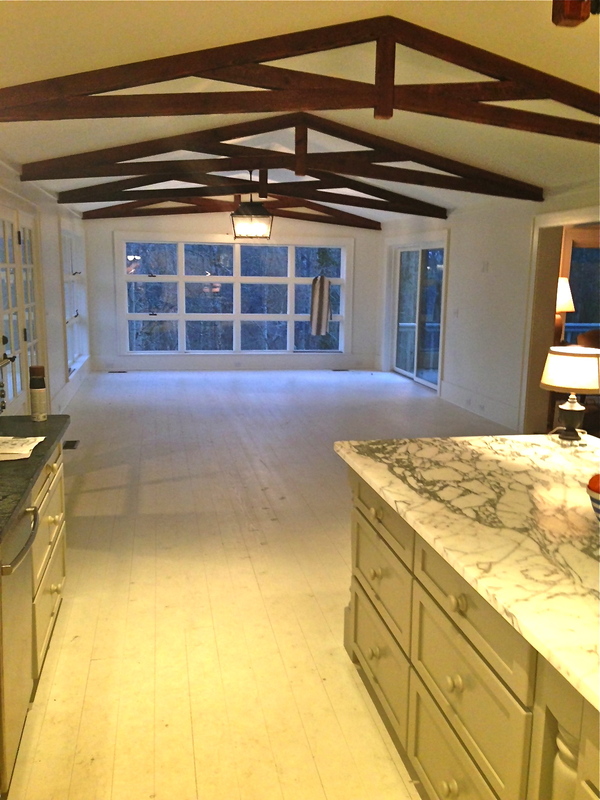 A base coat of Benjamin Moore Ivory White will go on in the morning … then the fun begins. After many color trials the final choices are Ben Moore’s 925 Ivory White, Cromwell Gray and Sandy Hook Gray. The pattern will be a grid filled with alternating circles and squares that was adapted by Keven Hawkins to fit my kitchen floor. Check back ASAP for the floor updates. The Kitchen floor awaiting beautification! Looks great can’t wait to see it painted! So exciting! More soon. It is very exciting but, this is the slow part. Love it! Looks awesome! Is that marble? Lisa, I am so excited to see the final results. 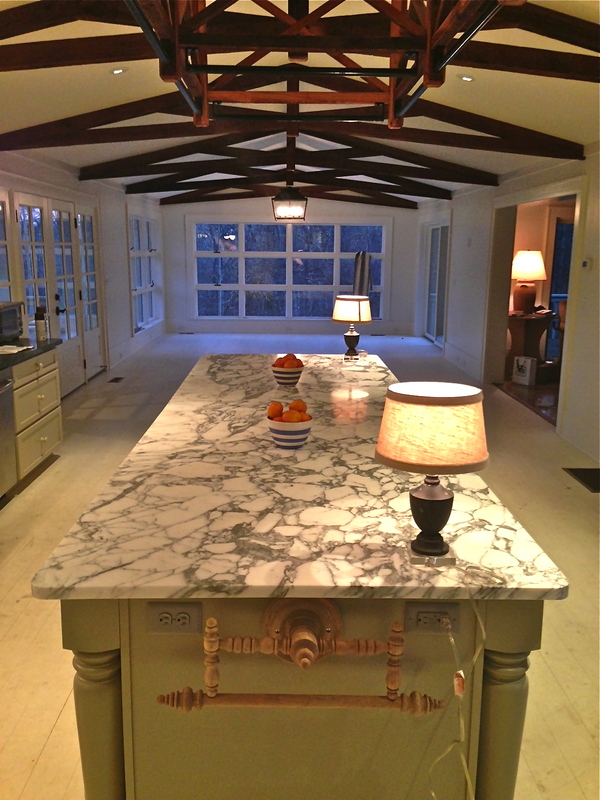 The Island is honed Arabiscoto marble-counter tops are honed soapstone. Can’t wait to see them…they are going to be amazing! Measuring and taping all day today. I know I’m supposed to looking at the floors….but I couldn’t get past the incredible towel bar on your island. Where in the world did you find that? Antique? Jennifer, This one is a reproductions from Boxwoods in Atlanta. I have an old one in the powder room. Just call Boxwoods and ask for Randy or Tom and tell them you saw it on the blog-they will ship it to you ASAP. serendipity…I’m headed to Atlanta the last weekend of this month. Boxwoods is already on my to-do list! Taking this picture. Thank you for the source, fingers crossed it is available. They are located in the new ‘Home’ store. They now have the building next door too. I love the web design of your blog! Very dainty and pretty! I also love your kitchen, especially the counter. Good luck with the floors!